Can anyone point me a book where it has a proof of Theorem 1.7 (ii) of Jun Shao's book - Mathematical Statistics? I need this to show that given a distribution on one space and a collection of conditional distributions (which are conditioned on values of the first space) on another space, I can construct a joint distribution in the product space. There is a print of the theorem below. Not the answer you're looking for? Browse other questions tagged probability probability-theory probability-distributions statistical-inference conditional-probability or ask your own question. 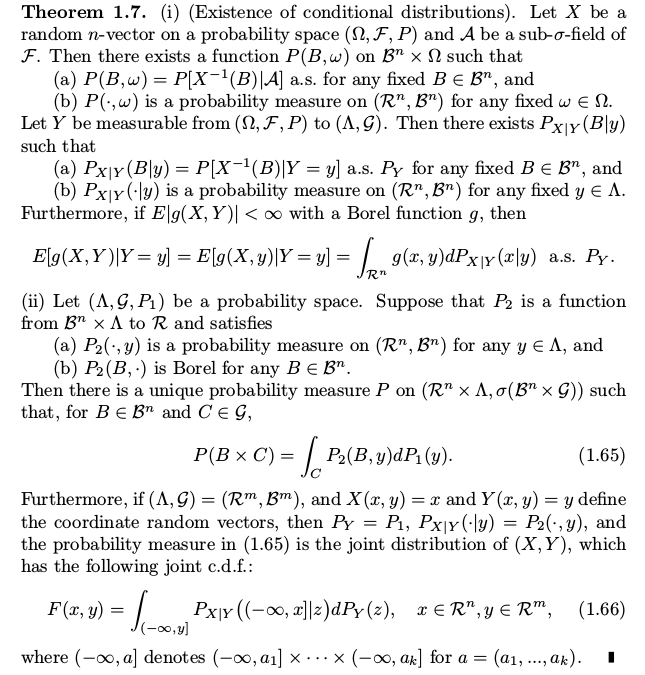 Joint probability distribution from all conditionals. Why is it not possible? How to construct a joint distribution given a continuous space?